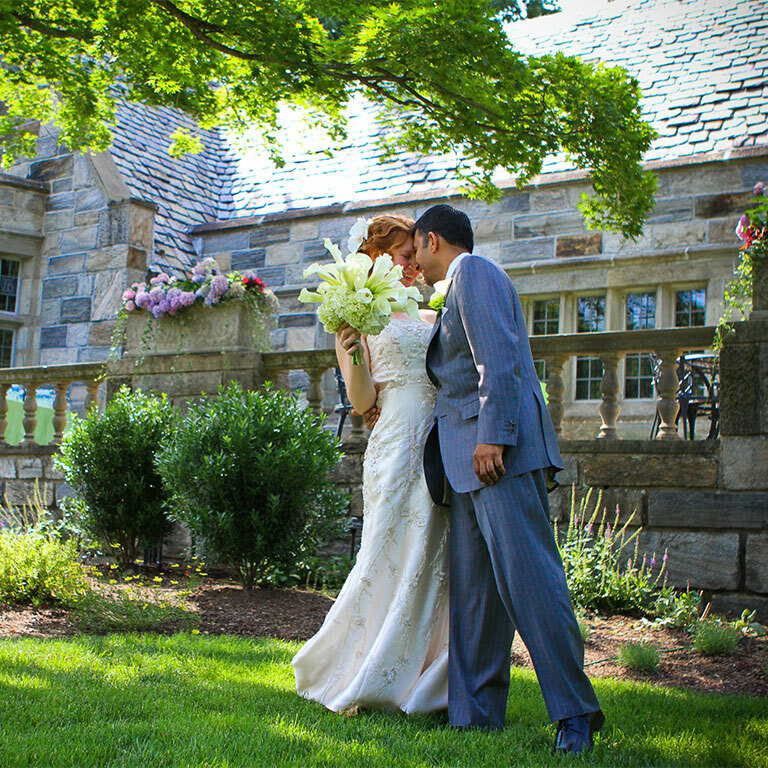 Weddings are a long and cherished tradition at the Merion Tribute House. Bridal couples have walked through these arches to greet their guests and celebrate with friends and family since 1924. The balcony is a favorite place for brides to toss their bouquets and for couples to pose for pictures. 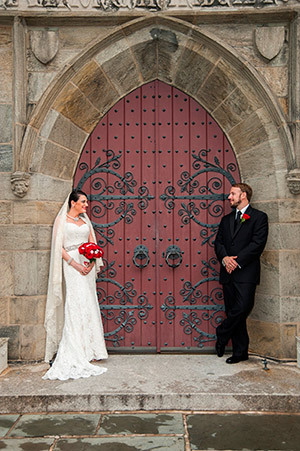 This castle-like venue is perfect for the fairy-tale wedding of your dreams! The Tribute House has an open floor plan that allows people to mingle while retaining the intimate atmosphere of a private home. Guests assemble for cocktails in three front rooms (the Legion Room, Lounge, and Memorial Hall), which connect to our spacious flagstone terrace. Oak doors open to reveal a ballroom set for 70 to 175 people, a band or DJ and a dance floor - all together in one room. Two lots provide plentiful parking for your guests. For those who choose to have a ceremony as well as a reception, the Merion Tribute House offers many choices. Outdoor ceremonies can be accommodated anywhere on our eight-acre estate, typically on the front lawn where guests can admire the bride's entrance and processional from our Great Doors. Indoor ceremonies can be held either in the ballroom (for guest counts over 100) or the more intimate Legion Room (for under 100). We provide and set up white chairs for outdoor ceremonies. If you choose to have your ceremony here, we grant an extra half hour of rental time and you may schedule a rehearsal here in advance. Thank you so much for everything you did to make sure our wedding was flawless. It was everything we had hoped it would be. Thank you for making our wedding dreams a reality! We had a wonderful time and received so many wonderful comments on the venue. Thank you for helping us have a great wedding. Your support before and during the wedding was much appreciated. Everyone loved the venue. Thank you so much for making our dream wedding so perfect. We had an amazing time! I am so happy we had our wedding at Merion Tribute House. Anton and I just wanted to thank you again for all the help and advice you gave us. You were always so quick to answer any and all of my questions and were just very helpful and dependable throughout this past year. Thank you and please pass along our thanks to everyone at the Tribute House. We had a beautiful wedding that we will never forget! Thank you for making our wedding day so beautiful and perfect! You all were so helpful and accommodating and we could not have asked for a more perfect venue! We just wanted to say thank you so much for being amazing. Leading up to our wedding on 11/1/15 and during, everyone was such a huge help! We have gotten so much positive feedback from our guests - not only about how beautiful the venue is, but alos how amazing your staff is. Thank you for everything - the wedding was beautiful and perfect with your help! More rave reviews can be found on weddingwire.com and The Knot sites. Our wedding was made even more special by all the wonderful staff at the MTH!